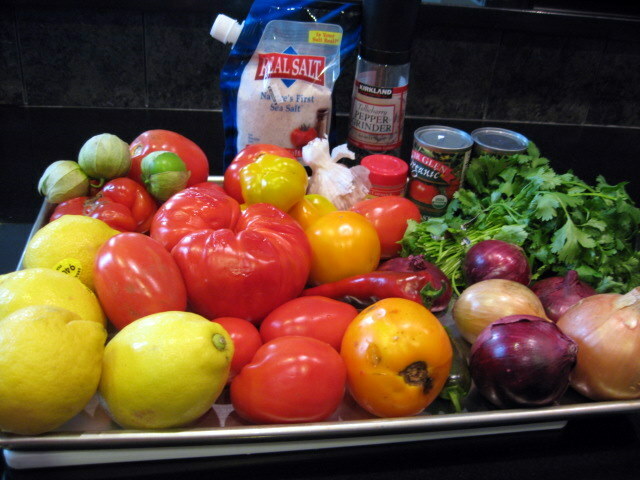 Inspired by the fecundity of our pepper plant and the vast array of tomatoes at the farmer’s market, we set out to make salsa. Chips and salsa is one of Alex’s favorite snacks, and there is always store-bought salsa in our fridge, so this seemed like a great way to strike a blow for more bottom-up food in the house. Making several pints at once also helps ensure that blow has staying power. While we’re usually very particular about our recipe sources, this time we chose one of the first we stumbled upon at a Pick Your Own web site, right here. If anyone knows how to deal with loads of tomatoes, it’s PYO people. The recipe has either one ingredient or about a dozen, depending on whether you use a prepackaged seasoning mix for your salsa. A prepackaged mix seemed rather beside the point, and needless to say we did not use one. A word to the wise: When chopping large hot peppers like these, consider using latex gloves. About 30 minutes after I’d dispensed with the peppers, my left hand started burning something fierce. Googling “help my hand is burning” turned up this curious home remedy: hair oil. Alex and I had both washed our hair recently, so that didn’t do much. I tried petting our cat a bunch instead, but I am not sure that cats sweat. In any case, it eventually got better. Tug the skin off the tomatoes. I found two forks to work well for this – one to hold and one to pull. 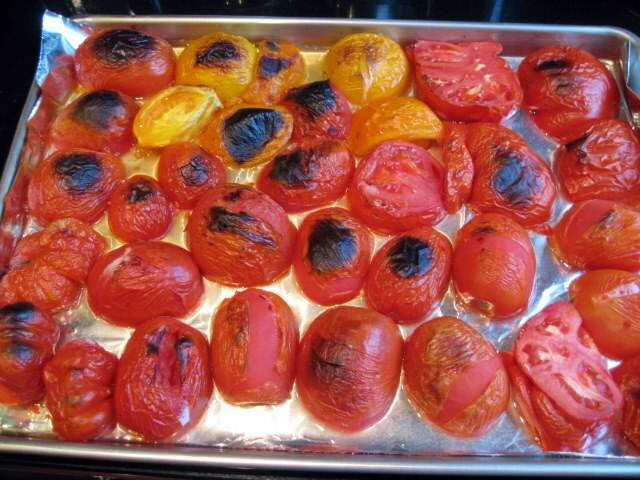 Place naked tomatoes in a colander in the sink to drain extra juice. 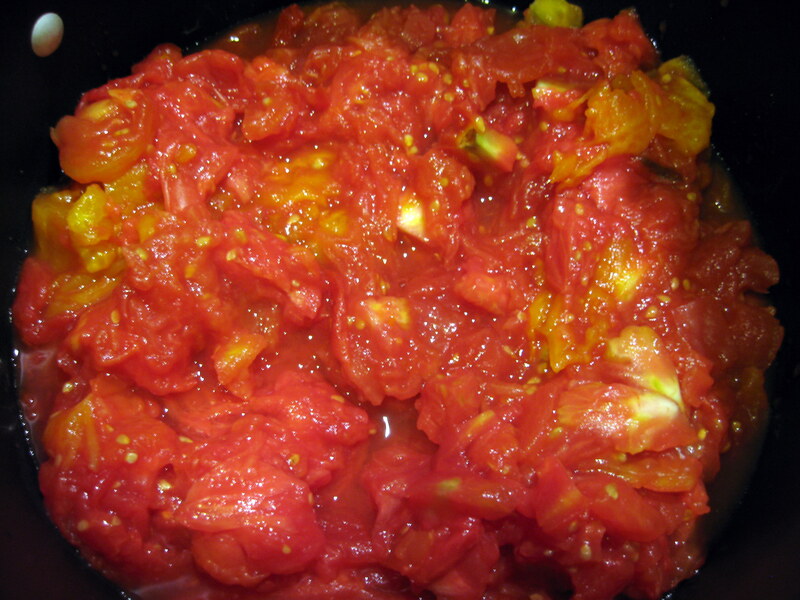 Once tomatoes have drained sufficiently, chop them as best you can and then put into large pot. 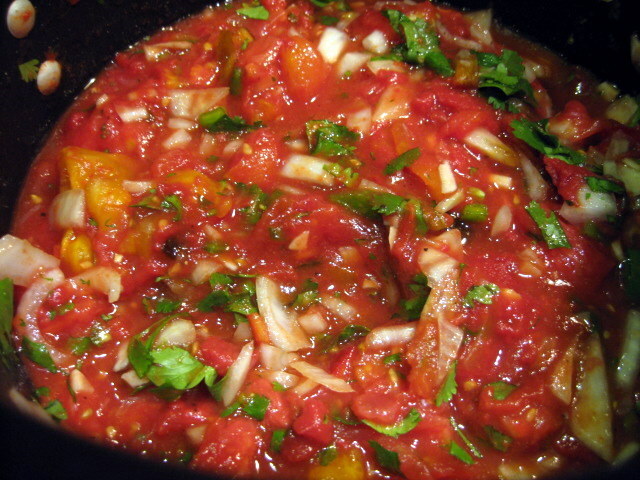 Add other vegetables and seasonings to pot with the tomatoes. 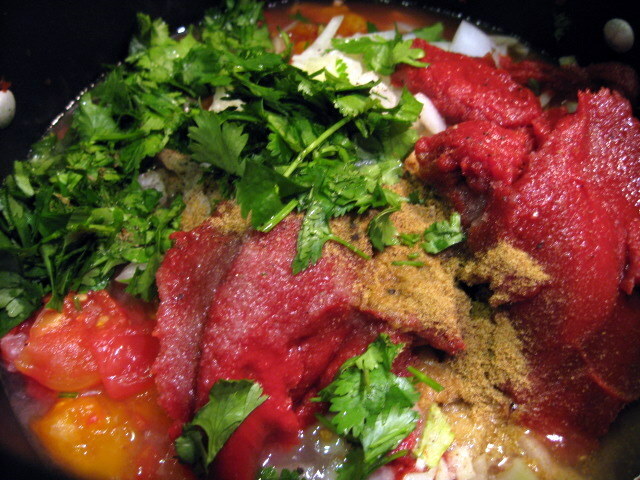 Turn on heat, bring to gentle bubbling state, and then turn down to let simmer for 30 minutes. 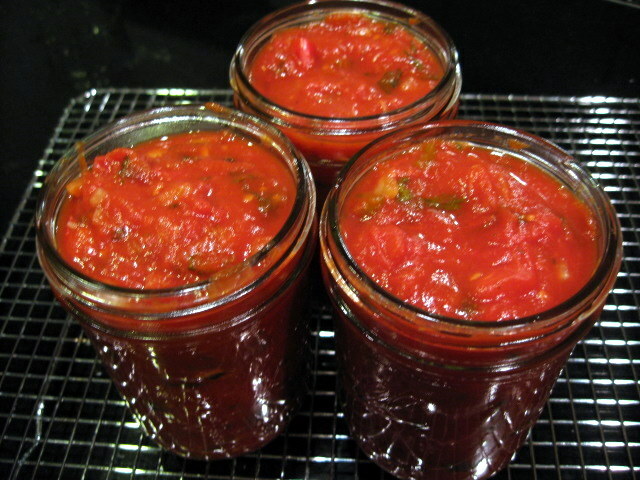 While the salsa is cooking, sterilize the jars and lids by immersing them in boiling water for a few minutes. 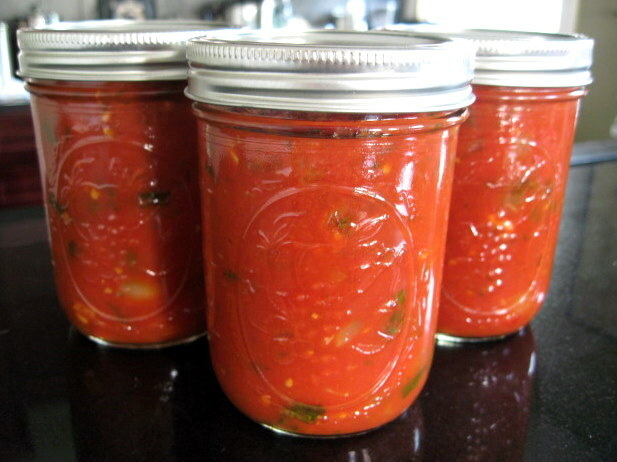 Fill jars, leaving 1/4″ headroom, clean rim of jar, then put lids and rings on. Place jars in boiling water for 15 minutes (assuming you are at sea level). Lift the jars out of the water and let cool. You will eventually hear the lid pop, which tells you that the seal is good. If you don’t, you can check the seal by pressing down on the lid. If it gives, or bobbles up and down, the seal is not good, and you must refrigerate the salsa. Otherwise, you can keep it in your cupboard. The result is the best salsa I’ve had in a long time, great with chips and on burritos. Alex claims it tastes sweet because of the 1 1/2 tsp of sugar, but I think it’s the sweetness of in-season tomatoes. It is definitely spicy, however – adjust the peppers downward (in variety or quantity) if that’s not your thing!